The legend of the Madonna of Bachelors Grove dates back to 1982. 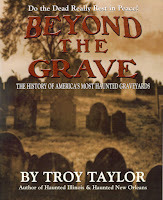 Within the 2000 book Beyond The Grave, on page 224 it states, "photos taken by the group in 1979 show a monk-like figure standing near the cemetery fence. The figure appeared to be wearing a hooded robe and holding a baby in its arms" It then goes on to mention, "Oddly, this was three years before the Ghost Research Society collected any accounts of the White Lady!" But the legend of the Madonna of Bachelors Grove can be very confusing. Original definition to the phrases Madonna of Bachelors Grove and White Lady are given to the apparition of a woman in a white dress that is reported as wandering aimlessly throughout the cemetery, while occasionally holding a baby in her arms. The most popular aspect to the legend is that you can only see the woman and baby together on moonlit nights, specifically when there is a full moon. Based upon the widespread use of the phrases in books and elsewhere, it is from these particular sightings that the phrases hold most of their historical meaning. The origin to the legend can be traced back to researcher Dale Kaczmarek, President of the Ghost Research Society in Oak Lawn, Illinois. The first source that mentions the phrases White Lady and Madonna of Bachelors Grove together is the 1989 book True Tales of the Unknown: The Uninvited by Sharon Jarvis. Within the book it is clear that the phrases White Lady and Madonna of Bachelors Grove are both attached to the same apparition of a woman and baby. Kaczmarek happened to be a contributor to the book as well. One particular reference from 1998 within The Republican states, "There were several reports of a figure of a young girl near one of the graves," During an interview of Kaczmarek for the Lombardian in October of 2000 the author stated, "A woman in white, with a baby in her arms, was also reported by local officers, and at first they never repeated the story of their sighting" She also went on to quote Kaczmarek as saying, "they thought they'd be laughed at by their friends and colleagues,"
Even though witnesses have reported the White Lady as a woman in a white dress walking throughout the cemetery, it has also been reported without a baby in her arms. Removing the baby from the sightings occasionally leads to confusion where the legend evolves into the White Lady occasionally "looking" for her missing baby as she still appears to be walking aimlessly throughout the cemetery. Authors have interchanged various phrases used to describe the apparition of the woman while speaking separately about different aspects to the legend. This appears to be the primary reason why some people are confused into thinking they are being told separate legends. Confusion has even struck authors themselves. One example can be found within the 2000 book Ghost Stories of Illinois. On page 103 it states, "One of the most famous phantoms of Bachelor's Grove is known as the White Lady or the Madonna. Some locals have also dubbed her, for no apparent reason, Mrs. Rogers." As found within the example just given, when speaking about the White Lady references to a Mrs. Rogers can be found. The first use of the phrase Mrs. Rogers can be traced back to the 1991 book More Haunted Houses by Joan Bingham and Dolores Riccio. Within the book legend states, "There's an urgency in her manner as she wanders about searching through the tombstones for a lost treasure or person." The legend continues that the apparition is thought to be the spirit of a woman that was buried next to her infant. At this point the legend of the White Lady evolves into that of Mrs. Rogers which is still in reference to the Madonna of Bachelors Grove. Within the 1989 book True Tales of the Unknown: The Uninvited, in reference to the White Lady and baby found on page 62, Dale Kaczmarek states, "To add a little fuel to the fire, there is a very small grave in Bachelor's Grove with the simple inscription 'Infant Daughter.' Makes you wonder, doesn't it?" At no point in the book does it make any reference to a woman looking for a treasure or person, nor does it mention that the woman is looking for a baby. Within the National Examiner in 1984 Kaczmarek had stated, "Except for the baby, the descriptions are always the same --- a mournful white-clad phantom wandering aimlessly among the tombstones." The author of the article then goes on to mention, "Kaczmarek believes the tormented phantom is desperately seeking other children in her family who were somehow lost to her." It was not until the 1991 book More Haunted Houses was published that information was more widely available as to the speculation of the White Lady looking for her infant. There was at least some correspondence between Kaczmarek and the authors of More Haunted Houses before it was published. How much of that conversation found its way into the book may be irrelevant, but the important factor is that the phrase Mrs. Rogers was an outcome. The name Mrs. Rogers is actually in reference to Luella Rogers whom is buried in lot 15 next to the "Infant Daughter" headstone. Burial records indicate that the Infant Daughter headstone is located on a plot that lies next to Luella Rogers and Daniel Rogers. It was not until 1995 when Brad Bettenhausen, President of the Tinley Park Historical Society in Illinois, made additional genealogy information available through a Where The Trails Cross publication that incidentally gave some insight into a portion of the facts surrounding the Mrs. Rogers legend. Contrary to popular legend, the Infant Daughter burial is not a child of Luella Rogers, or Daniel Rogers, all of whom are buried next to each other on the same lot. There is genealogical evidence to support that the Infant Daughter headstone was actually a replacement headstone for Emma Fulton after it went missing. Evidence indicates that the Infant Daughter headstone should have been placed on the east side of the Fulton family monument, not on the west side where it was cemented into the ground upon its "replacement." So that would make the burial site of the Infant Daughter headstone belonging to Marcia May, daughter of Bertrand Fulton and Kathryn Vogt. Overall, regardless of which person is actually located within the burial site of Infant Daughter we now know that the child does not belong to Luella Rogers. Usage of the phrase Mrs. Rogers continues to be printed in books, newspapers and other publications. Various theories are given on its meaning throughout the Internet, some of which may or may not have any relevance to factual information. But the theories themselves have the potential to spawn a new era of legends surrounding the White Lady. Only time will tell if they will have any historical relevance to local legend such as usage of the phrase Woman In White. The legend of the White Lady becomes more clouded by references to multiple reports of a humanoid-type apparition. A prime example is the case of the photograph presented on the left-hand side captured in 1991 by Jude Felz, former member of the Ghost Research Society in Oak Lawn, Illinois. The image is reported as capturing an apparition of a woman sitting on the base of a headstone during daylight utilizing black and white infrared film. One sentence from 1998 within The Republican newspaper states, "There were several reports of a figure of a young girl near one of the graves, but Kaczmarek had to see it to believe it." In reference to tours being given at the time it also went on to state, "He showed the amazed audience a picture of a transparent woman sitting on a tombstone." Presentation of the photograph in this manner is the primary reason why it became associated with the legend of the Madonna of Bachelors Grove.